Lobelia Alcohol Extract is formulated to potentially address certain symptoms of respiratory tract issues‚ which may help promote relaxed breathing. 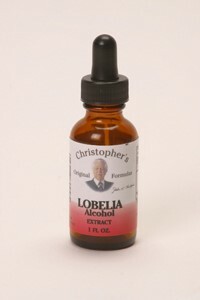 Lobelia Alcohol Extract contains Wildcrafted Lobelia Herb‚ which may provide relief for some respiratory tract problems. Wildcrafted Lobelia Herb is sometimes used as an ingredient in many cough syrups. Wildcrafted Lobelia Herb may thin phlegm‚ which may make it easier to expectorate. Wildcrafted Lobelia Herb could possibly have sedative properties that relax the respiratory tract and promote good breathing. Some suggests that Wildcrafted Lobelia Herb may potentially encourage sweating‚ possibly supporting the release of toxins from the body. Wildcrafted Lobelia Herb ** Daily Value not established. Directions: Shake well before opening. Take 3 droppersful three times a day or as directed by your Health Care Professional. For optimum results take 1 hour before or after meals as to not compete with digestion. Do not use during pregnancy or give to small children except as directed by your health care professional. Store in a cool‚ dry place. Keep out of reach of children.